Firstly, selling a property by auction has many advantages over normal open market sale (called private treaty sale) when selling through an estate agent. Why Do People Sell by Auction? Speed. Selling by auction is the fastest way to sell a property at full market value. Marketing, viewings, auction day, exchange of contracts and completion in 4-8 weeks depending on how fast you want to sell. Compare that to a typical open market sale that takes 36-52 weeks without any guarantee of sale. Certainty. Selling by auction provides a guaranteed sale at a minimum reserve price within a fixed period of time. Legally binding exchange of contracts on auction day with buyer deposit of 10% and fixed completion gives certainty & security of sale. Full market value. Competition between all buyers in the market place ensures you get the best price for your property on the day of the auction. In most cases the sold price is more than the auctioneers estimate and way in excess of seller’s reserve. 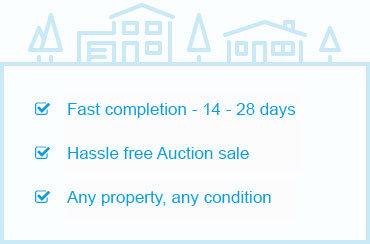 Any property can be sold by auction, it really is that simple. Although some properties will sell better than others. In need of modernisation. Any property that requires improvement will perform well by auction. Everyone wants to buy the typical run down house and transform it. Buy to let. Most buy to let properties are bought and sold by auction. Its fast, easy and the tenants can stay in the house with no loss of rent to old or new landlord. Can’t get a mortgage. Property where a buyer would struggle to get a mortgage should always be sold by auction to get the best cash price. Grade Listed houses, structural problems, non-standard construction, Japanese Knotweed for example. What Other Reasons Should I Consider for Auctioning Off My Property? Inherited and probate properties: Especially if in poor condition and multiple beneficiaries are involved, best price, fast sale and a transparent sale. Financial reasons: Sometimes speed and certainty of sale are really important and a necessary requirement to save the day. Setting a reserve price is a huge comfort. Personal reasons: Ill health, divorce, job loss, emigration, relocation, downsizing, release equity, the reasons are endless, the outcome is the same – best price and a fast sale. As we’ve outlined many different reasons for selling a property by auction, when you are considering to sell your UK property, Sell by Auction team is here to answer all your questions as our mission is simple “to help you sell your property by auction quickly, for the best price, with minimum hassle” as we take care of everything for you.